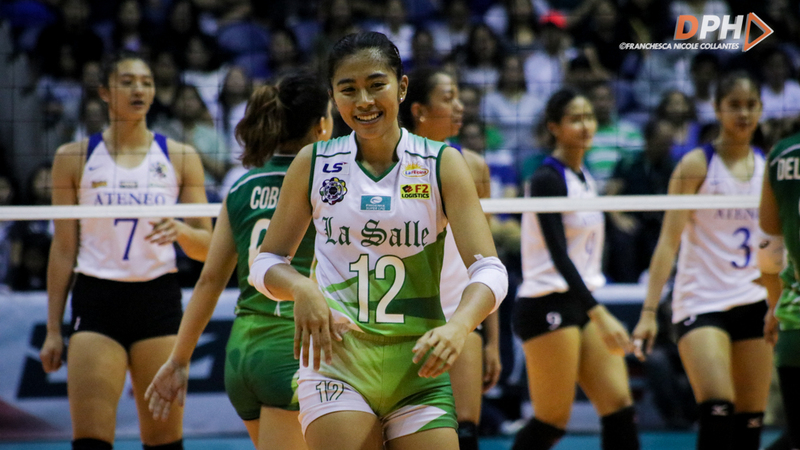 QUEZON CITY - De La Salle Lady Spikers still emerged at the much awaited Round 2 of "Battle of the Rivals" against the Ateneo Lady Eagles after sweeping them in three sets, 25-17, 25-13, 25-23, Saturday night at the Smart Araneta Coliseum. With that Lady Spikers win today, they are advancing to a Final Four seat. Lady Spikers Libero CJ Saga greatly help on their sweep win as she got 21 excellent digs and 14 excellent receptions. Jolina Dela Cruz, Des Clemente and May Luna also chipped in 14, 10 and nine points for the Lady Spikers win today. Dela Cruz got 14 points with 11 attacks while Clemente had 10 points with eight spikes and two kill blocks while Luna had three service aces for the Lady Spikers win. Ponggay Gaston and Kat Tolentino led the Ateneo Lady Eagles with seven and six points respectively. Ateneo is now down to 10-2, after their loss against La Salle and a one-win away to gain a twice-to-beat advantage. DLSU Lady Spikers will face the UE Red Warriors after the Holy Week break on April 24, Wednesday, 2 p.m., at the Filoil Flying V Centre while Ateneo Lady Eagles will try to bounceback as they will face the Adamson Lady Falcons on the same day and venue at 4 p.m.